What do you think of this tweet? How can a happy ending be sad? Sound off in the comments! 183 days until City of Heavenly Fire is released! Okay well i’ just going to assume the worst and say that Clary and Jace both died in each other’s arms during battle. 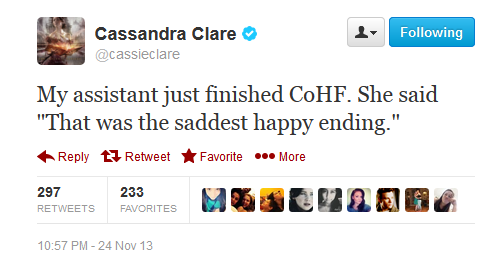 Maybe her assistant just meant it was sad that the series was finished, but it had a happy ending? Fingers crossed that’s what she meant!! How could there be a sadder happy ending than Clockwork Princess? I cried. I so badly didn’t want Will to die, and the when she was at Magnus’, I couldn’t deal. And Jem will die one day too. I’m curious to read the divergent series! I swear to God if she pulls a Mockingjay or Allegiant I give up. I simply give up. Well she wouldnt possibly know the ending for Allegiant if she kills one of her main characters it will just be coincidence! …I thought last book out of that series has already been released? Why wouldn’t she know the ending?? I expect it will be a lot like Mockingjay. Lots of main characters we know and love will die or be gone, and we will be left with our protaganist couple picking up the pieces. I found Mockingjay to be a very moving, thought-provoking, and realistic ending, completely appropriate for the characters and themes of the series. Not all great endings are happy ever after. Oh god, all those stories that breaks my heart~! I could actually accept Jace’s and Clary’s death if they would die together, but if only one dies my heart will break. Magnus, Simon, and Alec if any of those three people die I will enter eternal sadness. Sorry to say I don’t care about anyone else’s death. But I really need Magnus alive to keep up his record of being in all of Cassie’s books. Yes I need neither of them to die and to GET BACK TOGETHER BY THE ANGEL. Honestly I am really really really worried! I saw the tweet and like freaked. Jace is going to die i knew it! actually i`ll be happy if Jace dies they guy has been through a lot and the ebst way to defeat Evil is sacrificing himself! It should be happy and satisfying, but not overly perfect or it will seem cheesy. Many perfect endings to the greatest books ever written are sad. It is one of the deepest emotions of the human experience. I am so nervous!! I wanna read it so bad, but I don’t, but I dooooooo!!! BY THE ANGEL! This makes me SOOOO nervous!!!!!!!!!!!!!!!!!!!!!!!!!!!!!!!!!!!!!! As long as it has some logic I will be okay with it. None of that Allegiant nonsense. Guys, please be considerate and do not allude to endings from other book series here! Thank you! Yesss please!! I haven’t read any books in Veronica Roth’s trilogy, but I just bought them and will begin them shortly, so I’d appreciate not accidentally reading anything about the third book! Impossible. The saddest happy ending was Dollhouse, obviously. have you thought that she means she is sad that the book has ended? it has a happy ending but she is sad it is all over ? OMG I hope so! I hope that she is just teasing us! I was just getting ready to say that. Think about it. I’m sure it’s a happy ending hence the happy ending part but the series is over hence the sad part. I hope none of them turn into silent brothers like in Clockwork Princess. that made me really really really upset. Okay if Malec dies my life will be in sorrow and please don’t talk about the Divergent series I’m on Insurgent and I would like to find out what happens on my own without spoilers. The reason for that was because I had gotten spoilers for Beautiful Redemption and another book and I was really mad. Maybe her mom dies and Clary and Jace do get married after the death of her mother. how can a happy ending be sad and a sad ending be happy?!?! Ok. Cassandra, you will kill me D’: . Estoy muy ansiosa por leer el libro ya. Espero que salga como espero , aunque , bueno , también espero que me sorprendas. I HOPE SABASTIAN BECOME A GOOD PERSON AND HE IS STILL ALIVE. Omg yea I hope that also! I bet Simon dies to save Clary. The one and only thing I know is that I will die before I will have readen CoFH. Us something to cheer for and feel that sense of fulfillment and triumph I mean that’s what makes a great story heck even the last movie did it justice but does it make sense. Isn’t that what we want after all hopefully that’s what Cassandra has in mind and that teases are what they are “teases”. I hope that clary jace and izzy don’t die.I don’t wanna deal with a bad end. the TID was sad enough for me. In a way i hope that they make all the movies to this series because when the last book comes out, i’m not going to be fully ready for their story to end. I mean who can get enough of Sizzy, Clace adn malec..
See I read this on twitter and um like freaked. It’s like waiting for death at your doorstep. the only characters that I actually care about are Magnus, Simon, Isabelle and maybe Jace, other than that I don’t really what happens to anyone else. Of course I’ll be sad if someone dies but I won’t be devastated unless it’s one of these characters. If you care for Magnus you should really start caring for Alec, because if Alec dies or something bad happens to him then it would kill Magnus.